Little bites of cherry cheesecake filled with diced maraschino cherries and crushed graham crackers. These no bake treats are pure bliss! Cheesecake bites filled with diced maraschino cherries and hunks of graham cracker crumbs! bites of cheesecake heaven.These baby cheesecake bites are filled with diced maraschino cherries and hunks of graham crackers crumbs. Need I say more? Now chilling is required here, or you will end up with a goopy puddle of cream cheese/sprinkles/melted chocolate when you try to coat these. It will not be pretty and you will be disappointed. Please do not skip the chilling. If you try to scoop, roll or coat these without the cheesecake filling being cold it will not be productive. It will probably incite some less than socially acceptable language. I'm just guessing here and in no way incinuating that this scenario happened in my kitchen. After mixing and chilling, I used a tablespoon cookie scoop to get even size bites. I then just dropped them into the coating of choice and gently rolled them around. This saves a step of actually having to roll with your hands and then coat. I coated these with four different toppings: chocolate sprinkles, rainbow sprinkles, crushed chocolate wafer cookies and, my personal favorite, a bar of melted Godiva vanilla bean white chocolate. If using the melted chocolate, just scoop and then dip into the chocolate with a toothpick, making sure chocolate has cooled slightly. I have to tell you that these were wildly popular amongst friends and family. I have had requests to make more of these. My daughter even called me at work to inform me that a certain store had the Godive chocolate bars on sale. I believe that may have been a hint. I can't wait to hear from you to see what different toppings you used for these. Mix it up and have fun! In a large bowl mix cream cheese and powdered sugar together. Add maraschino cherry juice, diced cherries and vanilla extract, mix well. Add finely ground grahams mixing just until incorporated, there will be some pockets of grahams, this is ok, you want little hunks of grahams in these. Chill for at least two hours. Scoop with tablespoon scoop. Roll or dip in toppings of your choice. Keep refrigerated. May be removed from refrigerator 30 minutes prior to eating or serving if you would like them closer to room temperature. *I melted my chocolate in a glass bowl in the microwave in 20 second increments, stirring in between. My chocolate was completely melted after three trips to the microwave. Hunks of graham and maraschino cherries! Christy, these so so yummy. Sounds like the perfect treat. Thank you Dawn! Yummy and easy to make! Very nice. Ingredients/recipe and pictures look delicious. Thank you Catherine. As I was making these I thought they would be perfect for a little girl's birthday party or a baby shower for a baby girl! No bake is always good in the summer. Thanks Jas, cheesecake is a favorite for my husband and my dad. They love it when I'm in a cheesecake mood! I must admit that I like maraschino cherries! I shouldn't because I have seen how they are made, but I still can't resist! Anywho, love the recipe. Thank you! Hi Elizabeth, I can't resist them either, just in moderation. Thanks for stopping by! 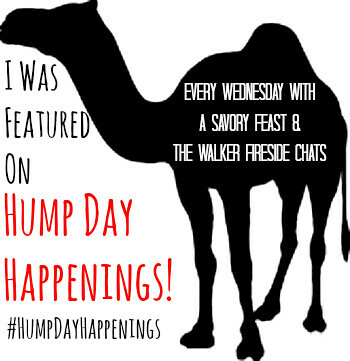 Hi Megan, always happy to share at a great party like Hump Day Happenings! They are delicious and hard to resist! Hello beautiful! This looks so amazing.Yum! Pinned. Thank you for taking the time to stop by! I hope to see you at our party tonight, it starts at 7 pm. We love to party with you! Thanks for pinning and visiting! Love to party with Lou Lou Girls! I absolutely love anything with cherries and cheesecake is my second favorite food. I also love how easy these are! I wanted to let you know that I'm going to be featuring these at the Retro Re-pin Party over at Sustaining the Powers tonight at 8pmET. I hope you'll stop by and link with us again! Hi Stephanie, cherries and cheesecake are a perfect combo. I am so excited you are featuring these at the Retro Re-Pin Party, a big THANK YOU to you! These look delicious! Thanks so much for sharing at Totally Terrific Tuesday! This week's party starts at 10pm tonight. We hope to see you again!